Almost every business class discusses passive income in one manner or another. Passive income is income you receive when you are not actually involved. You are not actively working in place to create the income. This is what makes many people rich. One can consider their savings account a venue for passive income since it is earning interest when the owner is actually not participating in any particular activity. Whether the owner gets out of bed each day or not, the account makes money. All business owners should be applying this idea to their business. That is what the vehicle business card holder aims to do. The vehicle business card holder will bring you income whether you get out of bed or not (assuming your car is not hidden in your garage). Vehicle business card holders are not all made the same. Ours has been used throughout the country since 2000 and is proven to work. There are no broken springs, no flimsy covers, and no chance it will fall off your car. — Never miss a sale! — Proven to work on your vehicle! Our car business card holder for the car window helps promote residual income over time with only a small initial cost. 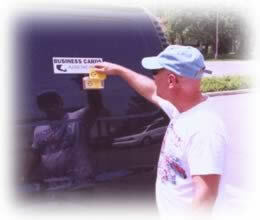 Every time you drive the car, your car business card holder will be giving you free advertising on your window! How many cars, vans and trucks do you see with banners on them? How many phone numbers do you actually write down? Using our window car business card holder makes it easy for customers without a pen to just grab a card. What holds the vehicle business card holder in place? The packet comes with 3M adhesive strips which hold the mounting piece on the car. Once the vehicle business card holder mounting piece is in place, the box easily slides vertically onto the vehicle mount. Are the “Take One” stickers included when I purchase the vehicle business card holder? Yes, you will receive 2 stickers, one for each vehicle business card holder. Where is the best place to put the vehicle business card holder on my car for sales? First choice is usually the rear of your car. 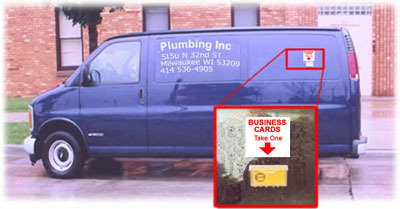 The second most popular location for the vehicle business card holders is the passenger side rear window. At this location, when you are parked, the driver of the car next to you is “forced” to see your box when approaching his vehicle. Will this damage my vehicle? Rest assured that these have been well tested and proven to have no harm to your vehicle. The vehicle business card holder adhesive strips can easily be removed from your vehicle’s surface. I have used these for years but now I have a new car and want to move the vehicle business card holder to the new car. Where can I get new strips and stickers? Originally designed for cars, customers keep coming up with new ways to use our business card holder. Check out how customers are using our business card holder for wall surfaces 24 hours a day, 7 days a week! will be well protected from rain. Yard Sign Advertising Business Card Holder: Do you advertise on yard signs? Attach the wall mounted business card holder to your sign. offer customers information without placing flyers under windshield wipers? Use our business card holder = problem solved! business card holder outside your door so customers do not have to search for a pen. COUPON Business Card Holder! Have you thought of printing coupons on your business cards and leaving those in the box? Now customers can find you! We sell two business card holders together to give you flexibility and ensure you never miss a sale. I live and work in Florida, and with all the heavy rains the car business card holder has stayed dry so far. Great product, and I have noticed a few cards missing! People that see it think it’s an innovative and great way to get your name out there. Thank you for getting this out to me so fast too, I am really looking forward to receiving it. I belong to several organizations, one of them being the Orange County Association of Realtors, and I think the car business card holder will be a big hit and I will for sure tell them about your great service and that I got the items from your website! I have the car business card holders mounted on 4 of my trucks. So far so good they seem to be staying put! So thanks for the follow up and I will be in touch when I need some more. I like the car business card holders. Great quality and exactly what I wanted. The follow up from your office has been excellent. I didn’t require any special attention from your office but I received top-notch service, and follow up as though I was your most important client. Thank you. My car has been stopped at a red light and the driver behind me got out of his car to take a card from the vehicle business card box!